OPINION: Does Malaysia really need a new carmaker? Home » Cars » OPINION: Does Malaysia really need a new carmaker? Does Malaysia really need another national car company? Prime minister Tun Dr Mahathir Mohamad seems to think so – earlier today, during a dialogue at the 24th International Conference on The Future of Asia (Nikkei Conference) in Japan, he said that the country has ambitions to start another national car project, in partnership with countries across the region. The idea behind this is his belief that a national car company must be Malaysian-owned, something that he thinks Proton is no longer because of its strategic partnership with Geely. It is also borne of the belief that Malaysians have the capacity to do almost 100% of the development of a motor vehicle, something that they should aspire to achieve. Public opinion on the matter in the hours since the statement have been very much against the idea, with the latent thought being that there is no need for the country to have another such project. Aside from entailing expenditure that Malaysia can ill-afford to have at this point, the very thought of another national car company sounds frivolous, given that there are already two on the scene. Technically, Proton is still owned by a Malaysian company, which is of course DRB-Hicom. Geely bought a 49.9% stake into Proton, which doesn’t make it the primary shareholder. The idea that national pride is at stake here should be cast aside – for example, Geely has also bought almost 10% of Daimler shares, and is now the biggest single shareholder of Mercedes-Benz’s parent company. Does that make Mercedes any less German? We don’t think so. Proton, for long languishing despite protectionism, looks to be on the slow road to recovery – new models are coming, and under Geely already has aggressive plans to export to SEA markets, with Malaysia to be made the right-hand drive production hub for this region. There is also Perodua, a very good example of a local company backed by foreign partners. No longer rebadging cars now, the automaker is dominating the local market, with its latest market share being over 50%. Would a third player be as successful? It could, but it would have to come up with cars that people want, and can afford. The thing is, Malaysians want affordable cars, whether it be local brands or not. The last thing we want is another round of government protection in terms of competition and taxes. You only have to look at how the scene has shaped up over the past few decades to understand that this is not how the game should be played. The spin could come from the partnership that has been bandied – in 2015, there were talks of an ASEAN car project between Proton and Indonesia. This could be a natural successor, driven by Mahathir. Electrification is also a possibility, though how viable such a dedicated commerce can be in what is still early days for the format remains questionable. Ultimately, though, it is all about the question of money, and venturing yet again into the business of car manufacturing is going to need a lot of it. Given that a number of public transport projects have been cancelled (especially MRT3, which would have been beneficial), there’s no denying that austerity is very much the buzzword. A new national car project goes against that grain, and sounds like a very, very poor idea. No!!! Our country has enough debts already and we have been paying for proton for almost 25 years! Enough is enough!! It’s time to move on. It doesn’t matters now. PNB & EPF hold majority of UMW and 15% of TCM. Honda, Merc, Isuzu & VW under DRB. Mazda, BMW & Hyundai under Sime Darby. Kia & Peugeot under NAZA. A 3rd national car (likely rebadge Suzuki) would make our local car market more choice other than P1 & P2. Perhaps this P3 can be exported to Indonesia like Daihatsu Sirion? Having shares in the local market doesn’t mean having the majority shares of the company. Anyway, P1 and P3 qualities are way too low compared to their ‘originals’. Corruption in the auto industry in Malaysia is so bad that all car companies ran away from Malaysia and opened in Thailand. They made Thailand the Detroit of Asia. We lost about RM1 trillion in investments, all of which went to Thailand the past 30 yrs. We also lost few hundred thousand jobs for Malaysians. We don’t need another car maker. We need to eliminate corruption completely. Read again, when did i said having market share? Indirectly our GLC/government that now control the foreign car maker operation in Malaysia and milk some profit of it. How you know P3 quality will be low? Had you forget about P2 or you are time traveler? Why does pipu seem so upset about it? This was what he promised to do if he comes back, and the pipu voted him back so hes just tepati his Manifesto. So strange lah pipu here…. leaders who kept promises r harangued and kicked out while those who breaks them r adored and kept on life sapot. We voted for a clean Government 5 years ago but we got songlap maximum….so how? leaders who kept promises r harangued and kicked out >> You mean the guy who Failed to keep his promise to reduce car prices by 30%?? Whatever is NO MORE PROTON 2.0 ….Period!!!. This idea must get LOST …. Close down Proton, but keep Perodua. Simple and final win-win solution for all rakyat. But then john says we cannot let the 9000 workers with no job. Better close down Proton….todate already taken over RM20 billion from gomen. Still no profit. They overcharged Proton by 10X and gave Proton super low quality parts. This is why Proton got a bad name. Actually Proton is a good car. Just that these greedy vendors and suppliers busuk Proton’s name kaw kaw by giving low quality parts at super high prices. Once you get rid of all the UMNO heads and kronies who make up all the vendors and suppliers, then you will see Proton shine like a bright star!!! No need rocket science to figure this out. Proton, like all other projects in Malaysia, was to make big money for cronies and UMNO. I don’t understand why you blame the vendor if the design, quality and technology was way behind other manufacturers even the perodua. That’s why Malaysian like perodua more.. Just look at the road… At least in my place majority is perodua and outside country product…. Also Perodua cars are the main cause of traffic jams and causing lack of parking spaces in major cities. Also must get rid of Perodua cars too. Anyway ,UK view Perodua car as rather unsafe and they treat this Perodua like JUNKS..
Stop blaming the vendors. They also supply to other brands and are doing fine. Most of the proton previous vendor or supplier are the chinese. Since when the chinese had become umno members????? You are right. If Proton were properly managed, then Proton would not have suffered. A 3rd car maker will not create any excess. It will create industries (like how Proton was) and business oppurtinities downstream and upstream. It will create jobs across the board. Don’t say if. The day they created Proton they also said if. Then the rakyat suffered. Same with all other CKD cars in Malaysia. To qualify for CKD, wajib for Toyota, Honda and Nissan, BMW Mercedes to take parts from UMNO Kroni vendor. Sure, you can have another new carmaker in malaysia. But no more protection and put it to global stage to compete straight. If you survive, you succeed, we respect. If you failed, lose not people tax money. People not going to be burdened again. Yes, we need a car maker. We have to think in a broad picture. When tUN talk about new Malaysian car, he is talking about solid investment flow to our country, technology transfer to our country, creating millions of high technology related job opportunities in Malaysia, creating huge revenue income to the country. So why not? I fully support Tun. GO FOR IT. In New Malaysia (or some say Old Malaysia 2.0), your opinions doesn’t matter. Only HIS opinion matters. Deal with it. Just no need n no more.. if can just no need all the national car, cut down all the car tax..That is more important. We are consider the few top most expensive car prices in the world… We protected P1 n P2 by increasing all the others car prices, just cause of protect the National car..
And i believe most of the people owned the national car are cause of no others choice by choosing the cheaper in Malaysia. Assemble & rebadge the Swift 140hp puhleese.. Instead of a need for a new car maker, better to reduce car prices. That is more important. Malaysia has the most expensive car prices in the world. Why is this so? Very simple. We protected Proton by increasing all other car prices substantially. In the late 80s, precisely in 1989, one could buy a brand new Toyota Corolla for RM20k. now, the same Toyota Corolla in Malaysia (called Altis) cost RM139k. A whopping 700% price increase. We can thank all the price increase to Proton. All car prices went up 700% just to protect Proton. Since the inception of Proton, Malaysians have overpaid by over RM300 billion for our cars. This figure is based on current prices vs the price we were supposed to pay if Proton was never born. “Malaysia has the most expensive car prices in the world” haiyo dah lah this guy stuck in 1980’s, fact also dumbly incorrect. please keep a bit of your dumbness for your family. Couldn’t agree more! The car’s price here are among the highest in the world! Kindly reduce the eksais duty & import duty in order to maintain an affordable price for the people..
Toyota Camry in US is US22k. Why not compare wit thai or indon? Why not compare the petrol price, roadtax price, car insurance price instead.. Including the car maintenance cost..
Bro..rm37k back in 1985 is not the same value as rm37k in 2018. You forgot to factor in the depreciation value..
Tolong sedar. Buka minda anda. definitely no la, you are equally asking do we still need another 1mdb. You can’t see the investment by imdb. At least for proton there is job offered and car sold. And increase in other car prices to protect proton. Also low quality car by proton. As long as affordable buyable for all rakyat then ok. Profit can help Msia to pay country’s high debt. TM really need alot business to do to pay country’s debt. Jiby is really sucker. Also to pay the forex trading scandal. Yes why not…remove corruption and otherbs.. it can work…its all bout creating jobs…new tech and skills…we are a trading contry …how long we can survive trading durians and rambutan ah? I support…u ppl are v v negative.. stop it! Let the boss explain his plans la …dont be so sohaii..
Agreed.Simply NO to another national car project.Enough of this national car idea.Eventhough I own a Proton,I don’t agree.Which country in the world have their own national car in these age.Previous century maybe yes.Nowadays people just want cheap, reliable cars. Doesn’t matter national car or not. And there’s is another thing economic of scale.To sell only in Malaysia is not enough.To sell overseas,you need huge fund for RnD.Different countries different set of regulations. What is the benefit as you mentioned above? how much you wan to invest? how long can get ROI? If not gain profit who will pay the bill? you think 5 years can earn back? He is ‘the’ prime minister. What do we all know that he does not? Just deal with it. He gets what he wants. gawd damn we need another car manufacturer but not for the public ! to go up against Bugatti Veyron ! his been playing on the wrong spectrum with proton! Please Tun M, do not start another mess again. Enough with your Proton than made other normal cars, a luxury items for us, Malaysians since 1985. You made, a used from Japanese and UK a luxury despite those cars generally 3 year old when they reach our reconditioned car makeshift showrooms. Unless you could offer us another Tesla. We have no worries. WE WILL ENSURE PH TO STAY FOR ANOTHER 20 YEARS. Yes. But don’t employ proton designers again. And their product planners. And the marketing team. And the after sales team (bottom 3 in JD power for the past 15 years!! ), including warranty and technical. Instead, why not open this project to ASEAN countries to participate. Ideas and market. I mean, proton has been around 30 years yet did not established itself in the Philippines and Vietnam, let alone Myanmar. ASEAN market is pretty much a big market, about a billion population. Many are poor but the market is ready and matured. Yes why not, but should not be funded by Govt (Rakyat). We do hv a lot of “Sick&Tired” in tbis ctry. And being so disillusioned cant see that this is not really about cars. TDM is wise as ever. Its all about building this country’s industrial capability. If we failed once then we must work harder to ensure success. We as a nation must try until we succeed. Only whimps becomes “Sick&Tired” after one try. Those ” Sick&Tired” only wish for this country to go back into raising coconut and palm oil in the country side and i sure hope they would encoirage his/her children to quit school now cos u dun really need an eduvation to pluck coconut …… ehhh a monkey can do it. Faster la go …….. And when u dream of owning a car dun worry as there is no national car u can buy imported ones….. only that your coconut plucking salary wont allow you to own one. I support your statement sir. It’s not about the cars, it’s about building capability. Though honestly, I think another National Car manufacturer may not be the best way to go about it. But what else is there? Consumer Electronics might be the way to go if we want to emulate Japan and Korea. DR M seems so preoccupied with the idea of starting another national car project. What makes him thinks that it would succeed this time around? After more than 30 years, Proton is considered a total failure. P1 was forced to sell part of company to foreign partner in order to survive. Please don’t start another car project that needs protection in the form of heavy taxation to non national cars. Malaysians have had enough of all these bullshits. He successfully made a comeback despite all odds. What makes u think 2nd times not a charm? No need. We technically already have 4 car manufactures.. 2 are not active now..Naza and Inokom. Focus on making P1 and P2 competitive. If need to, let them compete in the same be segments and size. And they should produce cars that are relevant, and contain the latest safety features like full driver assist suites. Other manufacturers are focusing on hybrids and electric cars. Both might want to go on this direction also. The majority seemed to be training their guns on Tun M. I am surprised that an expression of a wish to start a second national car can rile up so many Malaysians who had hitherto have been all praised for the wisdom of Tun M. I believed the matter will be deliberated in details at the cabinet level and proper detailed study conducted before the government embarked on the national car project. Let’s hold our peace and wait for further details. Proton failed because of cronyism and patronage were evident at every level of the management and this included the vendors and parts suppliers. No. No. No more please for another national car. This is regressive idea. Please find the way how to reduce the current car price for Malaysian consumer. We have been weighted with the most expensive car price for many years already. Enough please! I see many people commented in PaulTan on the Gov promises to reduce car prices. Many do not know that there is no such thing as reducing the car price in PH’s Manifesto. They only promise some rebate or financial aid at 6 or 8K for first time car buyer. So, expect car prices to go way way way up if Mahathir launch his Proton 2. Mahathir did say the car prices in Malaysia is too low, and taxes need to be raised, he also said Proton is not the reason why car prices are at this crazy level. On the topic of needing a new car company. The answer is no. maybe his 3 billionaire sons can work together and come up with the billions needed to start their own private car company. call it, PaPaTon. True that. Deswai Honda dan Toyota sold more than Proton. 1)Improve the quality of life for Malaysians in terms quality and technology? 2)Sell at competitive price not just in Malaysia and worldwide? 3)Reduce the bankruptcy rate of the youngsters that insist on owning overprice non-national car? How about instead of talking about the high costs and the owners, why not hope for a national car that we can be proud of. Bring some class and suprise everyone. Sick and tired of cars. Just improve the rail network. I challenge all of you. Including the editors to show to me, vehicle making protectionism doesnt happen anywhere else around the world? Unless you can prove beyond resonable doubt the japanese dont protect their manufacturers, the australians do not lay a single protectionism act on makers, the koreans, the US or even the best of germans, then these arguments about protectionism should go away. Pity thing proton was sold to the chinese, yea yea for just only 49.9% share. Its akin to having your mom pole dancing because shes a woman. Afterall moms the word, isnt? Move on guys. And khairy. Just fly kite. You never made to sweat trying something. It’s clear that we are seeing traces of the old Mahathir which is not what Malaysians need and want. Proton was a huge mistake to begin with which caused the people to suffer tremendously. Tun should focus on public transportation and only when we can truly afford it. Only if it’s an EV company (only produce EV), and to be well managed (not like Proton), then it’ll benefit Malaysia. EV is something in the new age, and if it’s well managed, it’ll bring new jobs to the country, new business oppotunity, help to raise small & medium industry, even increase export income (I eventually we export the product). Not a lot of country have the capability to produce EV, and also the infrastructure to cater EV in the city, at this moment. If we start fast, we’ll have the advantage. Again, it must be well managed. People learn from mistake, we wish. Can someone list out the number of times & each amout that Proton had been bailed out by the gomen? Wasn’t that cronyism? Talking about pride of the nation…where do put our face if we can’t make world class products & sell in the world market. Another jaguh kampung? No we don’t need any what we so call national car, our market cannot accommodates any new player especially so call local brand. If Tun M feels, Malaysia have the talent, desire and competitiveness to start another national car it would be focus solely on full hybrids or electric cars as that is the future, all auto manufacturer’s are already into billions in R&D for these type of vehicles so why did not Tun M mention an aspiration to start a new national car of that sort or in that capacity, that would be a whole new perspective and I believe will be welcome by many. Its very clear because we don’t have that capabilities and will be depending solely on foreign tech knowledge and transfer for many more decade’s to come before we can be even considered a serious automotive player of our own national car. How can we truly build a national car or even think of starting another national car if that’s not in play. Dear Tun M, proton was clearly a mistake of the pass, lets not repeat history, we Malaysians have suffered enough paying for proton sub standard and poor quality cars all our lives, generation to generation, lets bygones be bygones with proton, let them do their own thing with Geely. If they succeed then you can always think of buying back proton but until then, leave proton on its own and forget about another startup nation car. Remove all excise duties and taxes for all automotive brands in Malaysia and let the people choose with freedom what vehicle brands they want to buy with their hard earn money and this should be accessible to all Malaysians. Car prices should be reduced. Nor more taxes over 100% for imported cars. We do need affordable cars now, not another failed national car projects. Of course we need it. We extremely need our own national car. What the use of 50.1% (Geely 49.9%) if the untung devided? Our own national car should and must 100% own by Malaysian and from Malaysia. Again I insist, we extremely need new national car company. why would we want a new national car maker? i’m pretty sure MRT3 would’ve been more beneficial to people rather than a new car manufacturer. and it’s not even that eco-friendly. atleast eco-friendly cars would’ve been abit beneficial to the environment. but instead, it’s probably just another generic economy car manufacturer. May God bless u all.. Seriously guys….i though you all more brilliant than this….my god, still a lot people seem do not understand the idea of national car..
It’ s not just about car…pls do some study… onegaishimasu…. These are the first misguided words from Tun M 2.0. I do hope Pakatan Harapan leaders are strong enough to disagree. No new ideas? Trying to return to the 1980s? Wake up, it’s 2018. And stop trying to copy Japan so much. They aren’t doing that well. They work so many hours a day and still have lower GDP per person than so many European countries or even Australia. It is better to take away the protectionist car tariffs and make cars affordable for poor Malaysians than to build a third car plant. We have driving “expensive” cars since Proton. Let’s be practical. I don’t think we need another carmaker in the country. It’s not our forte. Proton was struggling without help from Geely. What we need is improved transportation network that could ease traffic and commuter travel. Car industry is going in the different direction then what I think Tun has in mind. Future trends like electrification, car-sharing, e-hailing and subscription models are the future. car manufacturing has thin margin, and electrification where there are less components and the engineering hurdles are even lesser, the margins are thinner. Hence why there’s only a few big players making mass-production cars (civics, hrvs, etc) while other small players are making high-end supercars. we don’t have the market to ensure high-production rates (think 1 million cars per year) to capture the economics of scale. If we make supercars, we’ll be one of the other players that making a new supercar every other month. And the big players are thinking to make the car-as-a-service than something that you outright own. Proton was a bad example of how not to run a car company but we may be missing the bigger picture here. The ripple effects of Proton has been the creation of (admttedly crony) companies that never existed before Proton. These companies have developed skills that could be further developed with a national car project. The reality is that this time around, the technical skills needed to create is vastly less compared to the beginning so we might be able to produce a better car this time around. But like my statement above, the practise of appointing and paying high level bosses who contribute nothing to the company must stop. A lean company that is agile and responsive to consumers is needed but can M’sia really create that company? No. This is part of the reason the whole Malaysia welcomed his resignation and all supports went to Pak Lah in 2004. Personally, I don’t think Tun M really wants a new national car. What he wants is a Malaysian-managed company producing locally a product that can be branded Malaysian designed, Malaysian made which can be a household name. Any successes Proton enjoys from now on will be largely attributed to the management and direction set by Geely. Same goes to Perodua, behind them is Daihatsu/Toyota designs and management direction. And even with Geely buying a stake in Daimler, Mercs are still mostly German Designed, German Managed. The question of National Pride is still a valid one. Look past the car that Proton is selling, and look what it did to transform the national manufacturing and automotive industry. Look at the number of MNCs that came here and set up shop to support Proton. Some of them have failed, but quite a number has been able to minimize dependency on Proton and serve global customers, hiring and training locals. Personally this is what I think Mahathir wants. A company that can manage, design, and produce consumer goods. Not only that, to produce it, you need a lot of vendors and suppliers to support it. And instead of importing components, a large part must be produced locally and ultimately designed locally. We can’t keep being just a manufacturing country, we need to fully take the next step and be the designers and creators. A car is the one we know can generate such a movement and provide that path, I don’t know what other product can do the same for Malaysians. 1st of all it’s a no no. But judging from Dr.M’s sarcasm, I believe his intention just to troll Najib’s decision in selling everything to China. If only we have to, I think the way forward is to engage tech giant like Apple and Google. They have a really big coffer and sit on a lot of cash pile. In years before they already engaging some Detroit’s ex in race for autonomous cars. Malaysia should collaborate in this field with them. Bring those dollars into our country and create more K-economy high income jobs for Malaysian. Not just create jobs for Bangla, Nepals, Myanmar. We can see the future of cars like TESLA. It is at the Silicon Valley not Detroit. If the P3 is started by a local company without government subsidy why not ? We have so many billionaire in Malaysia, they suppose to raise up and support the government initiative to move Malaysia industry into the next stage. Having a car manufacturer (I mean literally building a car) boost local economy, correct me if I am wrong, CKD require 40% of the parts are local made, so it help jobs. Having a car company (Not only just building but also designing) boost country technology level, it require high end technical people. Look at Korea, they pay the price but they have now world well known brand. I look at people in PaulTan trashing Kimchi car in the comment, they must be arrogant. Agreed totally with some of the comment here, P3 need to focus on something difference, e.g. ==> Electric Car, Not Hybrid. In China, they are so many electric car maker wanna be, all of them estimate to be able to build a electric car, least RMB 20 billion to RMB 30 billion (RM 10 Billion to RM 15 Billion) is needed. Most of them get their own funding to do it. With the electric car, it will also need to boost other industry like Battery Maker locally. Forget about P2, it still a rebadge company, using very old platform from Japan and still could not even build their own engine. Forget about Naza, they are just another rich company who become reseller and JV partner to build car in Malaysia. No, no, NO! Enough is enough..
We always talking about Malaysia maju..but the idea here is going backward..while the rest of developed country focusing on enhancing their public transport we still want to have a car company..gov cancelled public transport development due to high cost..but..how about to build a car company??? Malaysia needs a luxury car producer or exotic. Once Malaysia produce the fastest car on earth, then people will respect and the richest will buy from us. No need normal car or daily driven car for Malaysia. Just ensure you follow Italy Automotive route and Malaysia will be so popular with its car advancement. Mola da..the good ol’ days are back. First buat Plotong 2.0.. later u see buat Jambatan bengkok between Sg-JB, then songlap Petronas… it’s all back my brothers..
We need a national ELECTRIC car maker that specialize on small form with 2-4 sitters for daily commute selling at RM20-40k. Refer to Honda S660 for sample design. Maybe paul tan can do survey and share it with him. Improve the public transport better, improve the feeder bus coverage and services to complement the LRT, MRT and Kommuter. We have enough traffic jam now, no need to have another national car and encourage people buy more cars. No. what for the new P3 for? 1) you need to invest million ringgit in the manufacturing, office and etc. 2) How many years you want spending before get profit? please use the money for existing public transport, improve the quality and services. Before you invest on these. NO… if it will be a normal re-badge car company as there is enough of all kind of nonsense all these years… we have been paying the ‘protective fee’ for years..
we don’t need another car manufacturer. in the first place, we’re not capable to compete. Hyundai and Kia can even do better than us and it shows that we’re behind them. it’s better that the government enhance the public transport system and also help the grab and taxi drivers to make a living. Ki3. He has not gone for 100 days and now he wanted another mess 2.0 which unfortunately geely also has not fully turnaround mess 1.0. Do make sure lge keep the cheque book & other dap members silence him out if he bring this wishful thinking idea out. What do you expect if you bring a 1980’s pm to resurface in 2018?? Different shirt but same taste. Even the jap pm did not meet him. Just mass produce bufori cars cheaply. Why not developing our own train? Malaysian would really love it if there is a good train system that can connect whole peninsular. It may sound impossible now, but hey in the 80s building cars is also sounded impossible what? eh hello paultan talk so much what do you know. please tell me how crony parts suppliers can jack up price kaw2 if no national carmaker? cannot explain right? welcome to bolehland. Malaysia must have their car project. Only then our country can progress to a higher level of engineering. Developed countries all started by building their own machines. Only then we have many more own highly qualified engineers to build things, own trains, own cars, own plane….etcs. All start by building small things and there will be failures. Look at countries who kept buying industrialized machines, have they progress and built strong economies. Sometimes, we do not need economies of scale, but expertise in building something better, and it starts by building something and fail. Mahathir may want to right what was wrong with proton because of baggage. Sorry Tun, we don’t support your idea. We rakyat just need Perodua is enough. I humbly against this idea as well. If they cancel MRT3 on the notion that it is too expensive, then a 3rd national car project would be all the same. We already have many industrial expertise working as vendors and tech provider to world class car makers, I think that is already a success from the original idea he implanted back in 1983. Now the country needs more public transport to minimize reliance on road going vehicles, which in turn would benefit safety to the masses. Our country has limited land space for more cars on the road, so if there is more cars, more road is needed and I personally thinks that is the last thing we need. No more national car. Proton and Perodua is more than enough as the budget choice of many. Yeah, go Please make an Électron’ since it is the only Atom that moves but make sure your new car can match its speed plus it has to be powered by Battery. Seriously this is becoming ridiculous. Why Japanese again? even Japanese think that German quality is better. You should always learn from the best, not from the second best! look at those German machinery invention on youtube, you would be amazed. They possess advanced machinery and automation not only in automotive but also in agriculture which has been ignored for long time. This could be another sector making $ for the country. We do NOT need another national car maker, enough is enough! Have to settle with years of obsolete and dinosaur P3 left over in case cannot sell overseas. Other things agree except big No ,NO to P3. Lotus was once own by Malaysia, was it a Malaysian car then? If its happening, either P1 national car status will be revoked and thus taxed higher or simply reorganise tax structure to tax them higher. But seriously, why want to spend billions on what the rakyat did not want to buy (and even hate)? Do what you can (high tax) to tongkat it but rakyat by and large have finally acted against this unfairness (by ignoring P1 – just look at P1 dwindling sale figure) and will ignore any car brand that screw car prices yet again. I believe all the rakyat want is lower car price or small price gap (between national and foreign brands) made possible though lower taxes and duties particularly to foreign car brands. Price gap should only reflect genuine factors (not artificial factor e.g. protectionist taxes). Tax foreign/imported car fairly… and..
Just like what we have shown you in PRU14/GE14…. let the market force (rakyat force) decide. P/S: With respect, TDM could do well not to recycle super old ideas all the time. Please dont be out of touch with rakyat aspirations. As TDM is quite aware, when we do something.. timing is crucial.. I support the idea but not right now. Looking at our industrial capabilities, the automotive industry is where we have the most experience at. And our market here is not small. Car ownership here is up to 97% which is the 3rd highest in the world. Every year, over 500,000 cars are sold and more than half of those sales come from P2 and P1. If this new national carmaker can tap into even 1% of that market, it would equate to a profit of RM50 million or more and at the same time, having built better capabilities in terms of automotive manufacturing that will open up future jobs and future investments. If the market was small, Geely and so many other investors wouldn’t have bothered with Malaysia. Think about it guys, our cars here are double the price compared to other countries, and many of us can still own up to 3 bmws/mercs! We might be the only country in the world with citizens that would spend this much on such a lousy investment. I think it is a sound opportunity and investment based on 30 years of manufacturing experience. That being said, MRT3 to me sounds better and racking up more debt isnt helping. That would deter foreign investments. Perhaps a new carmaker by 2020 or later? It is actually a very ridiculous idea. And that’s putting it very mildly. From whichever angle you may want to choose to look at the idea, it’s a no-go; perhaps with the exception of just being able to give your middle finger to the one who sold off 49.9 pc of Proton. I remember Dr. M mentioning plans for a new national car company if Pakatan won the elections. For the most part, the rakyat were against it. It seems that is still the case today. 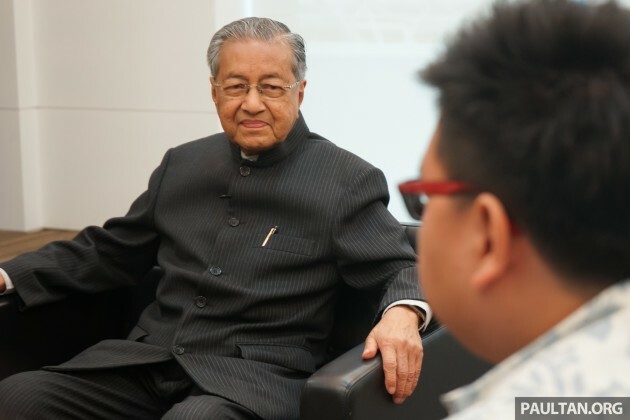 Personally, I believe Dr. M means well, he is just trying to realise his dream for Malaysia as a modern, self-made and intellectually prosperous nation. He wants Malaysia to become the Japan/Korea of Southeast Asia. This has always been his policy, even now, he still maintains the ‘Look East’ concept since the 1970s, even though Japan has fallen behind China in many areas, these days. The fact that Dr. M still wishes to co-operate with a Japanese (and not China) car company for the new ‘Protiga’ further confirms it. However, today’s reality is… Malaysia genuinely cannot afford to support another major government-backed national car project, the way it had previously with Proton, Perodua, HICOM and Inokom in the 1980s and 90s. Our economy back then was booming, and car ownership was also very low. Let’s not forget, back then, we had up to 300% effective tax on foreign-badged cars, and that only changed after the 2006 AFTA. Now, we have excise tax credits and EEV incentives, many CKD foreign cars (City, Volvo, Mercedes hybrid etc.) have very low effective tax, so low in fact, that some CKD foreign cars are now cheaper to buy in Malaysia, as opposed to our neighbour Thailand. Competition has also increased dramatically in the local market, to the point where both our national brands have multiple overlapping models, and monopolies have been broken in all segments except the local A-hatch segment (i.e. Axia segment). Costs have also skyrocketed since the 80s, and new regulations on safety and emissions are also getting stricter. And in the near future, alternative energy, lease-based ownership and autonomous cars will further complicate the market. In a nutshell, the game has changed, and Dr. M cannot win with his 1980s tactics. If he wishes to create ‘Protiga’, he will have to truly think out of the box, and create a company for 2020s Malaysia. In other words, ‘Protiga’ cannot be a typical car company, it needs to be something ahead of the trend and yet affordable for the masses (i.e. autonomous cars, alternative energy etc.). Most critically, Dr. M can no longer rely on protectionist policies, as this will only create chaos in the local market and burden consumers (similar to what’s happening now with Trump and his U.S. tariffs). Dr. M should also understand that a ‘Protiga’ might disadvantage Proton and Perodua to some extent, and seeing how well Perodua is doing currently and the promising prospects for Proton-Geely, it will no doubt be a huge and very risky gamble. Just to clarify, I am not against the idea of a new national car company, so long as it doesn’t unjustly disadvantage the rakyat and industry players, and so long as it’s done properly, as a Pakatan initiative (and not Dr. M solely), all the while learning from the past mistakes of Proton and Perodua. But if Dr. M intends to repeat the same old formula (i.e. rebadge, protect, monopolise) from the 1980s, then I’d have to object, unequivocally. Thank you for reading. No. Malaysians want cheaper cars instead of a 3rd national car maker. Take away the import duty and excise duty for all cars and let our national cars compete with foreign cars in order to improve our car making standards. Who is Proton advisor for 15 years? NO NEED FOR ANOTHER PER-TIGA!!! I think it is enough for the country to waste billion on national car. I thought this man had changed. If only i do undo my vote. A vintage car in the racing circuit is marvelous but not relevant to the racing track. We are bogged with trillion dollars debt and better to put aside the idea for the time being. Definitely not. Put the money in public transport first. We don’t need cheap quality cars with higher price tag due to protection and further driving up price of other cars. Have we not enough traffic jams already? No. First get our country on an even keel, then and only then go for it but not until then. Invite Tesla to invest and set up another gigafactory here in Malaysia will be better. ..TESLA is dying man..just look at their balance sheet..by all standards TESLA is failure..
You can have any number of national car manufacturers but in one condition, let them come in a competitive manner at their own risk and compete fair and square. Abolish excise tax and national car protection smoke screen. Let the market forces determine the prices. Hate the fact that our national cars were upgraded as exports and were sold at fraction of its price here compared to other countries. How is that our people always end up with second grade product like local Protons and fuel from sour crude when we sell upgraded n sweet crude to outsiders? U dont need national brand to provide cheap affordable car… i just hate tax figure in car price breakdown..dont u? No. No need. Use our resources to do other more urgent things. Dont waste our linited resourses on another Proton! Knapa we dont lash out tv quayle, mec dan mcm mcm brand malaysia yg doesnt do well pun in selling? He will partner from loval. Govt will inject money and after had roi can opt out of biz if the car isnt selling. Whats the problem? We should always support anyone wanna do a malaysian product. This can replace our dependancy on only depleting natural resourceas. Think big. At least this is not stealibg or laundering money. No need for a new national car maker. Rakyat has been the victim for having to bear ever increasing car taxes, and I supposed to protect national car interest. What we need is to build up manufacturers that are part of motor business supply chains targeting global market. How is it possible for Dr M to start and see through another corrupt prompt car company in less than two yrs??? It’s time he grows up and stop playing with his car toy. Even at 92 yrs of age! All branded vehicles are started by private individuals or company without their government help. You either make or break. With government backing they are not effective. Cut the red tape and issue license easier for those who are interested. Unless this could fix our car to salary ratio to be equivalent to modern nations, put this project to hell and never let it come back. We will suffer no more. Stop the project or feel the wrath of the rakyat ! Previous Post: SPIED: 2019 V167 Mercedes-Benz GLE drops camo!